MSR Carbon Reflex 3 Tent. Three isn’t a crowd in our roomy Carbon Reflex 3 tent. The non-freestanding tent offers uncompromised accommodations and double-walled protection at the weight of many 2-person ultralight tents. Featuring Easton®* carbon fiber poles, two full doors and two zipper-free vestibules, it offers the livability you want for the weight you want, for everything from your annual trip to section-hike the Appalachian Trail, to last-minute wilderness weekends with your buddies. 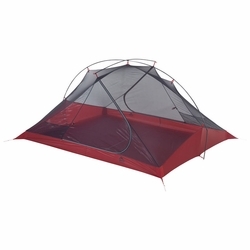 The Carbon Reflex 3 makes a great option for two, offering extra tent space to stretch out or room to store gear inside—and it has the built-in versatility to add a third any time you like.